HypaClens Sterile Eyewash Pods gently washes the eyes and provides sensitive and moisture replenishing relief for eyes that have been contaminated with particles or liquid. HypaClens Sterile Eyewash Pods contain 0.9% sterile saline solution that is ideal for irrigating eyes and general wound washing applications. 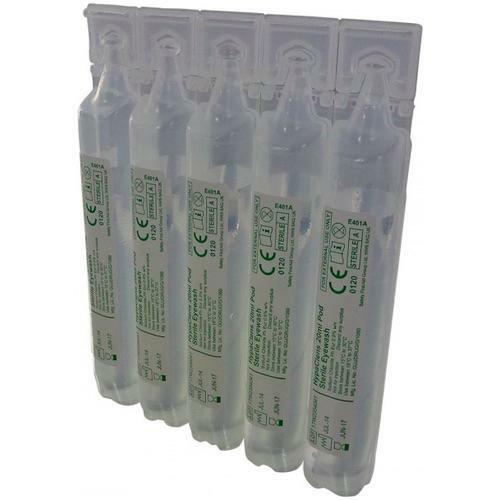 HypaCleans Sterile Eyewash Pods are highly recommended emergency eye irrigation for any workplace environment and come in packs of 25 x10 (250). The compact 20ml pods are an essential addition to first aid kits and cabinets. HypaClens Sterile Eyewash provides minimal wastage when compared to larger eyewash bottles. The strip format ensures pods stay together when stored but can be easily separated from one another in an emergency.